The unique combination of ingredients and spices is what makes Indian food so popular throughout the U.S. The placement of spices helps to enhance each dish, bringing you a burst of flavor in every bite. For a little taste of India in Nebraska, check out these 10 excellent restaurants. The food at Tandoor Indian Cuisine is made from fresh, natural ingredients, and is all natural and freshly prepared on a daily basis. Specialties include the traditional naan, Tandoori dishes, vegan and vegetarian curries, and authentic Bhutanese dishes. The restaurant has been in business for almost 40 years and is another family owned and operated establishment. Customer favorites include the gulab jamun for dessert, which is dough dipped in sugar syrup and a dash of rose water, and the Thimphu vegetable dish. There are no shortage of delicious options available at Kurry Express in Omaha, Nebraska which serves up Indian/Chinese dishes. From the Schezwan fried rice to the kadai paneer, Kurry Express is the place to go if you’re on short time but still want something flavorful for lunch. The staff is friendly and will always suggest the newest items on the menu. 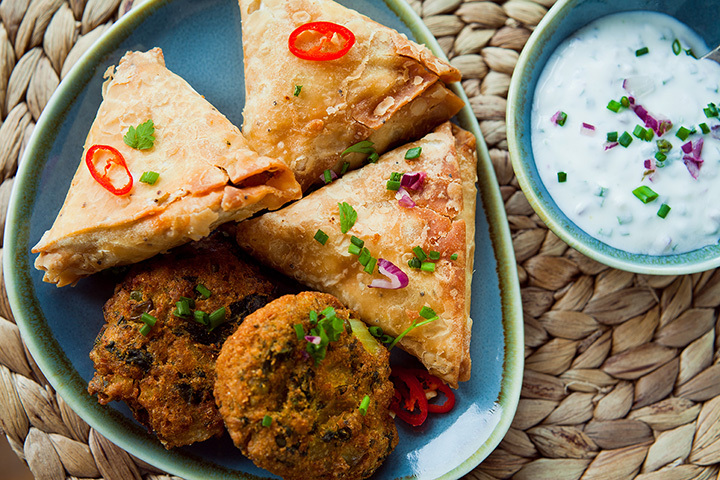 If you’re feeling particularly adventurous, try the samosa chaat! Aroma Indian Cuisine is quite new to the Lincoln, Nebraska area, having just opened in early May of this year. They provide delicious, authentic, Indian and Nepali dishes at affordable prices and is the perfect place to enjoy a great, quality meal with friends and family. In addition to offering traditional favorites such as Reshmi chicken and Tandoori lamb tikka, they also offer scrumptious options including aloo govi, which is curry cauliflower and potatoes served with rice. If you’re not feeling total Indian cuisine, Aroma also has a wide variety of mouthwatering Mediterranean dishes as well! Delicious food, great service, and the best malati kofta in town is why customers continue to flock to the Maharaja Indian Cuisine restaurant in Omaha. Each dish is freshly prepared and there are dozens of options to choose from, including the delhi papri chat which features homemade lentil dumplings and the paneer makhani, which is homemade cheese cubes cooked in a rich tomato sauce. The atmosphere of Jaipur Brewing Company and Restaurant is casual and relaxed, and the food is fresh, made from scratch and with high quality, fresh ingredients. Each dish is complimented by one of their many select wines and liquor, and the beer is brewed on-site. It’s a one of a kind dining experience not to be missed, and neither is the Tandoori marinated grilled salmon! It’s so tender and just melts in your mouth with each bite! The Oven specializes in northern Indian cuisine, known for its rich colors, flavor and unique style of cooking in a clay oven. Each of the Oven locations feature a different theme, from the historic Haymarket to the relaxation of the Cellar. The vegetable pakoras are all the rage here, as is the keema cole. Be sure that you also try one of the house favorites while you’re here! Ahmad’s Persian Cuisine is located in the heart of Omaha’s Historic Old Market district and has been there ever since it first opened in 1990. Tourists and locals alike delight in authentic Persian dishes, a warm and inviting atmosphere, and owner Ahmad Nazar who makes guests feel like one of the family. Enjoy the tender shrimp kabobs or the fresh grilled tilapia for dinner, and the traditional baklava for desert. The food at Flavors is made with a variety of different Indian spices and herbs, and each dish has its own distinctive flavors and aromas. Lunch is served buffet style with an “all you can eat” mentality, and dinner is ala-carte style created to please the taste buds of each customer. The philosophy here is simple: fresh, tasty, comfortable, relaxed and special memories to be made. Try a tasty bowl of spicy chicken vindaloo with one of their fresh, made to order mixed fruit juice! Here at Astoria Biryani, you’ll experience the combination of ancient traditions and the authentic flavors of India. They’ve been in business for many years, and offer new, innovative dishes along with traditional favorites. The biryani is by far the most popular dish featuring long grained rice combined with meat or vegetables cooked in a thick sauce. Dishes include the chicken or boneless chicken biryani or the keema biryani.